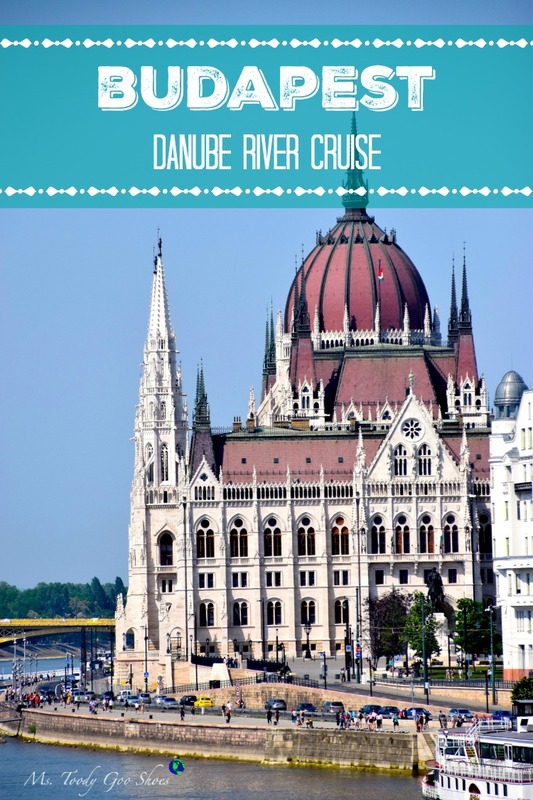 This is the final segment in a multi-part series about our Danube River cruise. Our luggage has been collected; breakfast has been eaten, and goodbyes have been said to the wonderful Ms. Joy crew. I run up to the roof deck one last time to get my first view of Budapest, but I've got to hurry, as we are disembarking the ship momentarily. 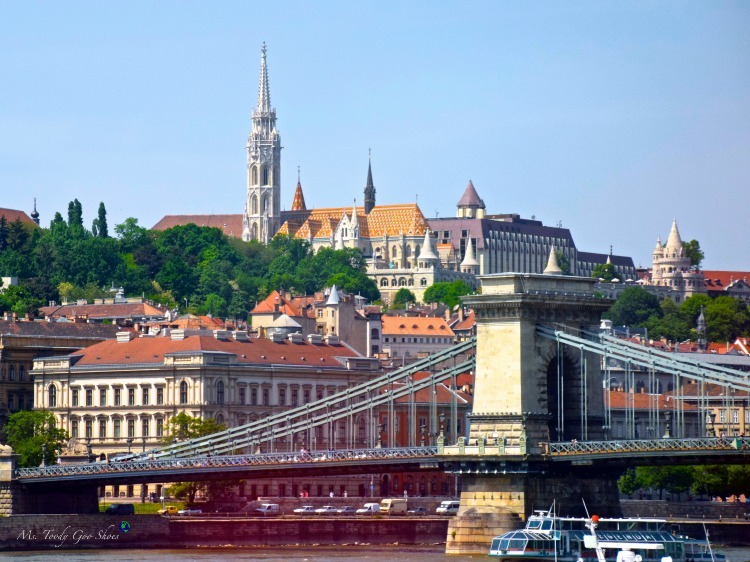 The remainder of our trip will be on land, with two full days in Budapest. Our arrival in Hungary's capital marks entry to the fifth and final country on our tour. 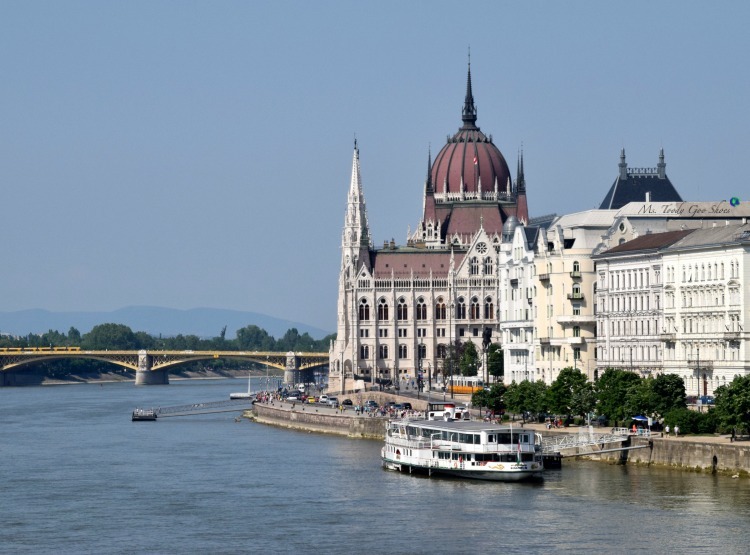 The Danube River splits Budapest into two distinct sections. 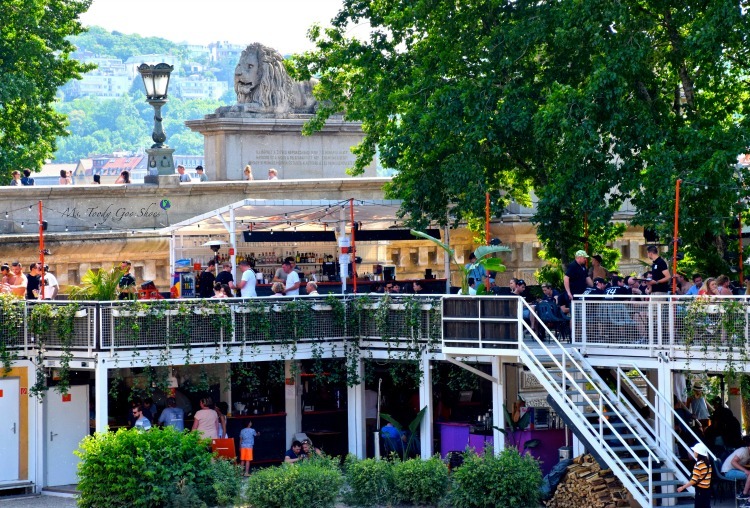 The only way I can remember which side is Buda, and which side is Pest (pronounced Pesht) is if I think of Buda as "buda"-ful and residential, in contrast to urban and vibrant Pest, which is full of "zest" (um, zesht?). 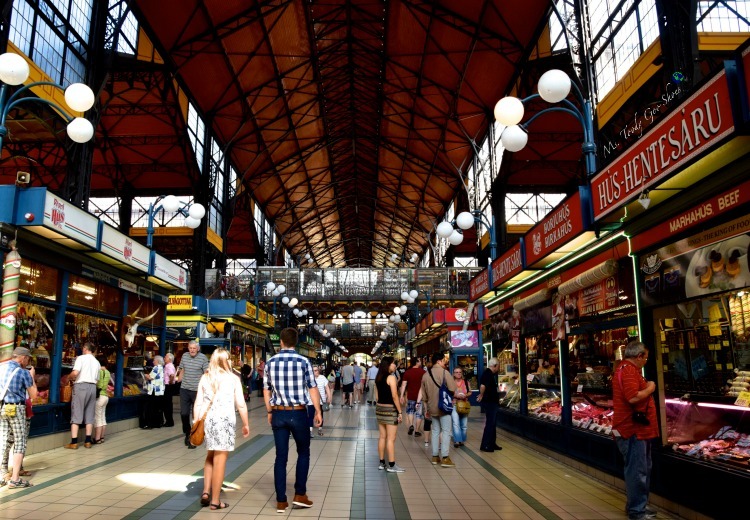 We start out on the Pest side at the Great Market Hall, an indoor shopper's mecca. 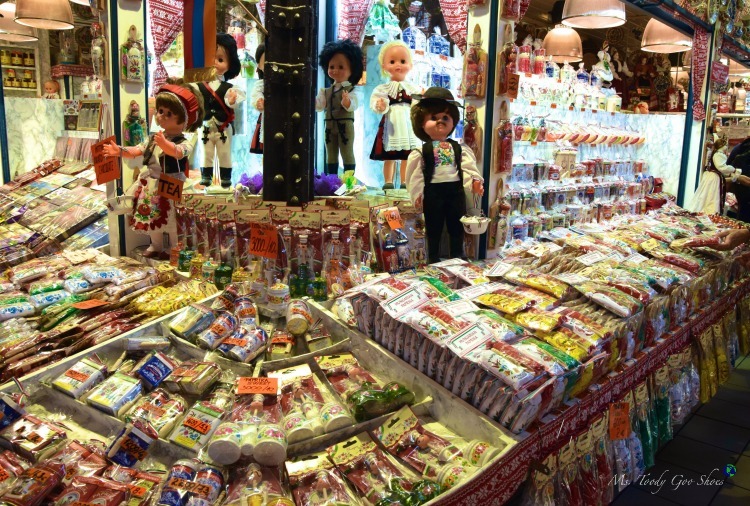 We have time on our own for souvenir shopping, and most of us make a bee-line for the paprika. Which is sweet? Which is hot? Buy both! I zoom through this cavernous space like a contestant on Supermarket Sweep, but in the end, paprika and hand-painted napkin rings are my only purchases. Back on the buses for the ride to Buda, we catch our first glimpse of the Castle Hill district. 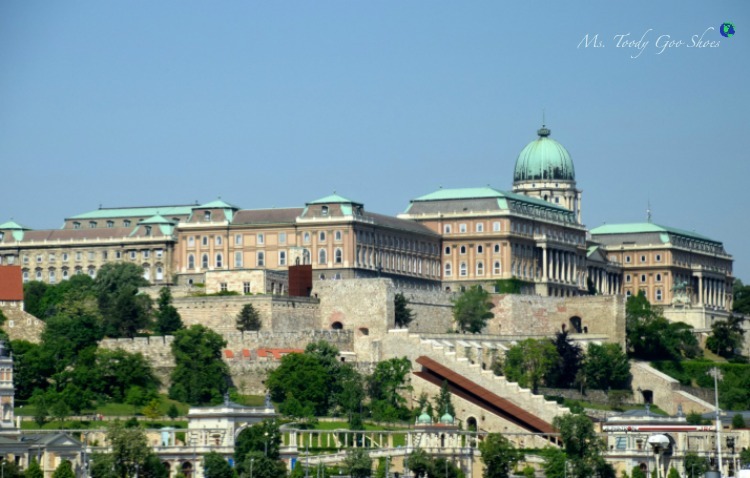 The enormous green-domed structure is Buda Castle, a World Heritage Site. 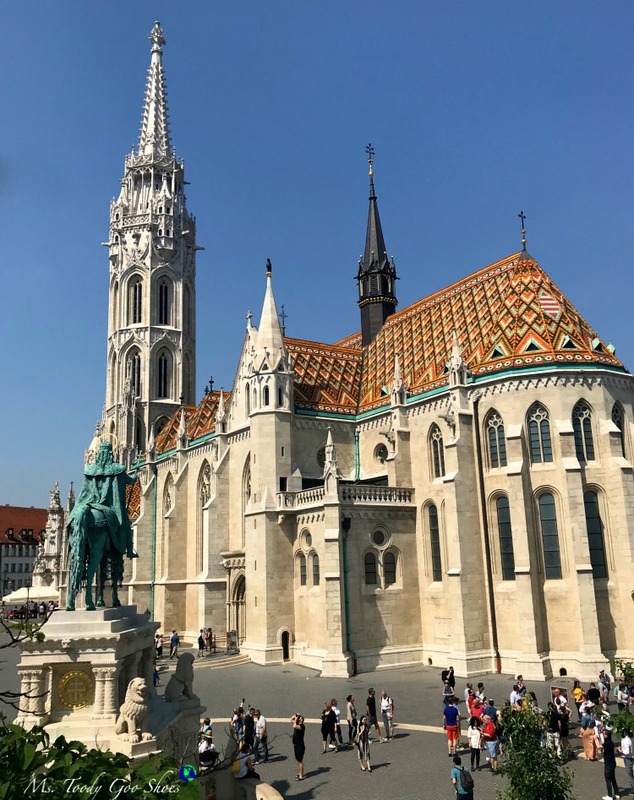 And then, St. Matthias Church, with its orange-tiled roof and tall spire, and the shorter, pointy tops of Fisherman's Bastion come into view. 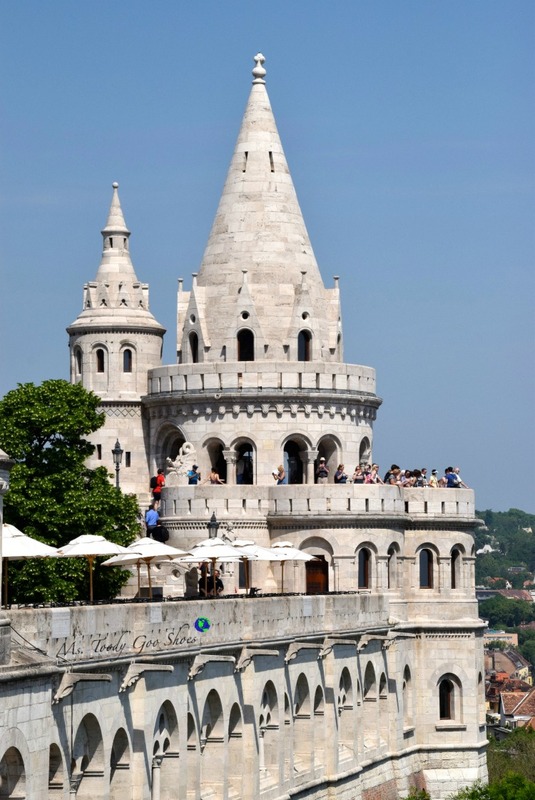 I'm a little confused about this Fisherman's Bastion thing. Wouldn't something that has to do with fish be closer to the banks of the river? I'll have to wait a little longer for that answer. The complex looks like it is taken right out of a fairtytale book. Maybe I've seen a few too many Disney movies in my life, but I'm pretty sure Sleeping Beauty just waved to me from that tower on the right. 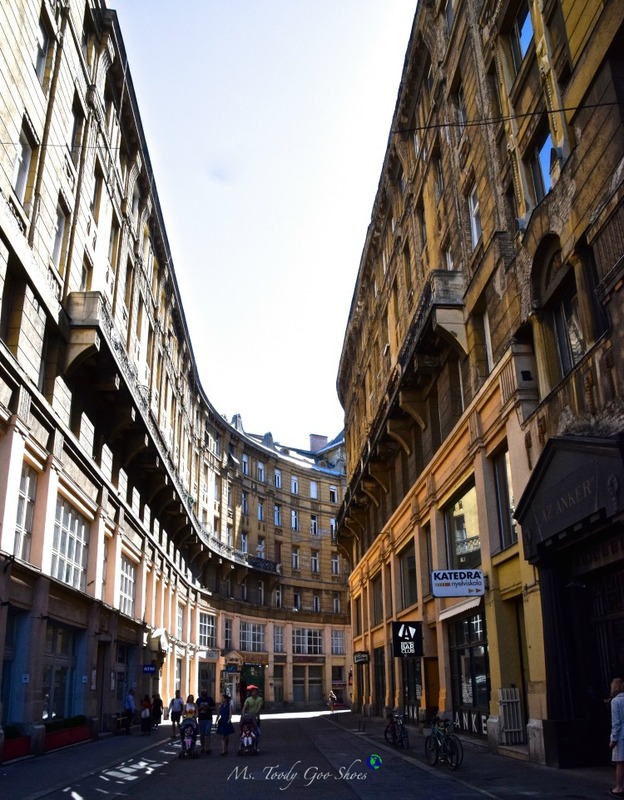 Our walking tour takes us through the cobblestone streets of Buda. We arrive at St. Matthias church........whoa, it's massive! I wish I had a drone, because I bet the roof looks amazing from above. 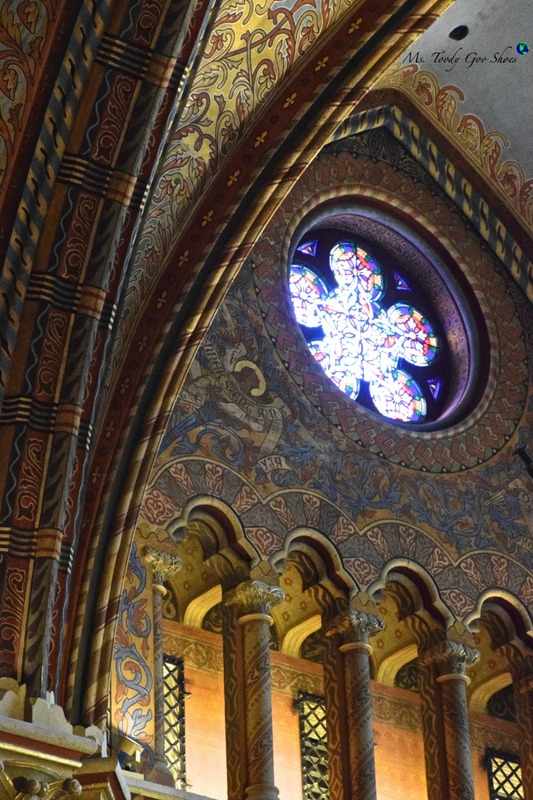 The interior of this cathedral, built in the 14th century, is divine in more ways than one. 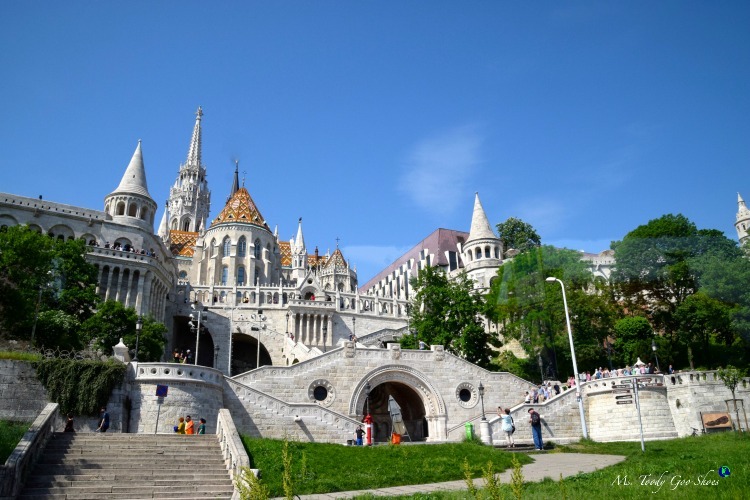 Back outside now, our guide gives the explanation for Fisherman's Bastion. 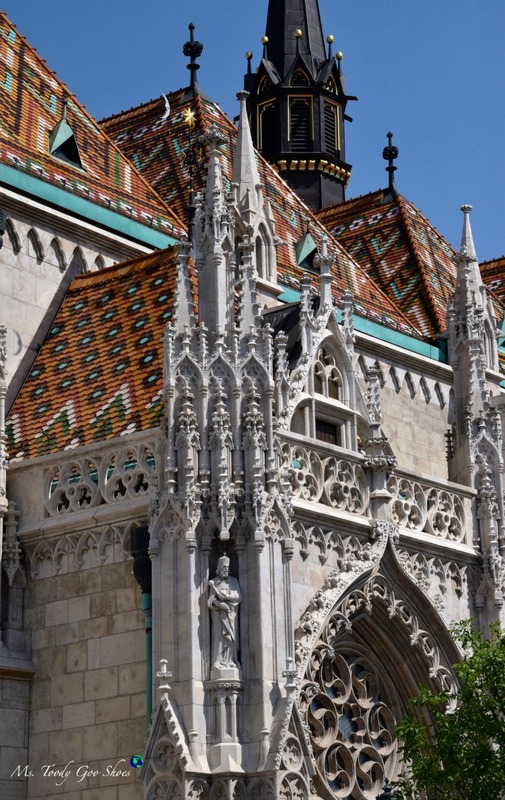 The towers were built at the end of the 19th century purely as a lookout for panoramic views of Budapest. One of the explanations for the name is that the fishermen who used to live in the city down below, guarded the castle walls. So that settles it. There's nothing fishy going on here. And the views? Spectacular! I remember reading that our hotel, the Ritz Carlton, is right across the street from the ferris wheel. The view across the river helps me get my bearings of this sprawling city. 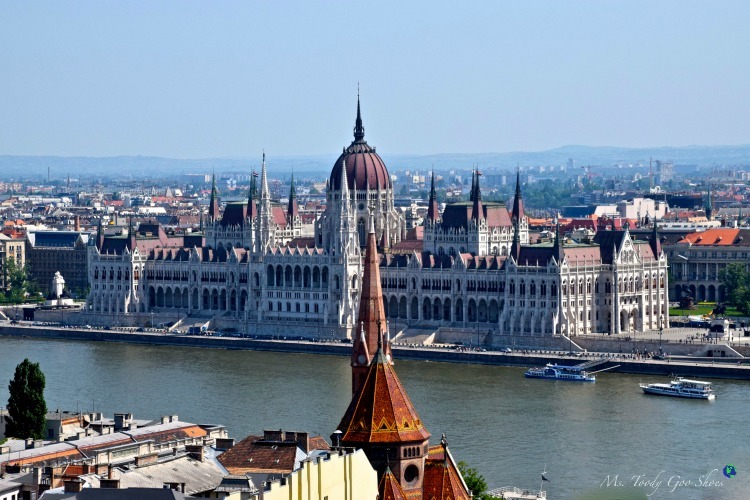 And there is the Hungarian Parliament Building! 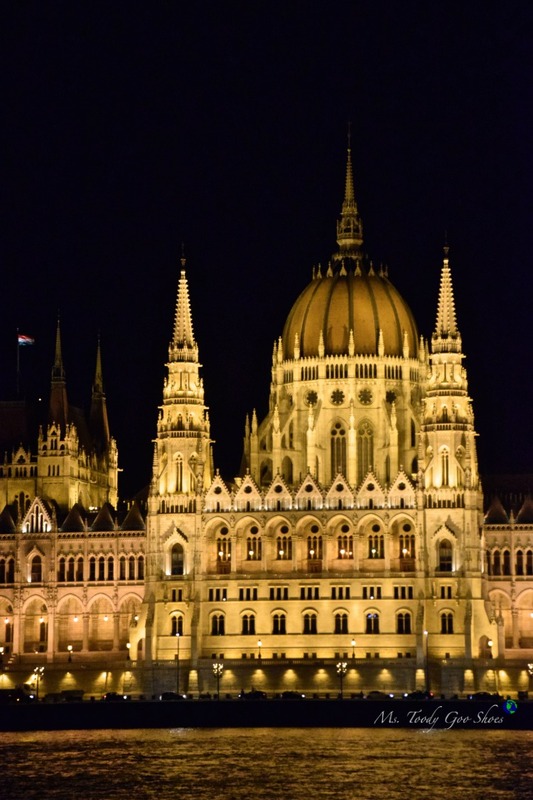 I've got to say, if there was one disappointment in our river cruise, it's that we didn't arrive in Budapest at night, sailing past this landmark building when it's all lit up. The tour is over, and we head to our hotel. A buffet lunch is served, and of all things, I can't get over the strawberries! They are dark red and as sweet as candy. The afternoon is at our leisure. I've learned from our quick overview of Budapest this morning that this is a BIG city -- not compact like Prague. However, our hotel is close enough to most of what we want to see. 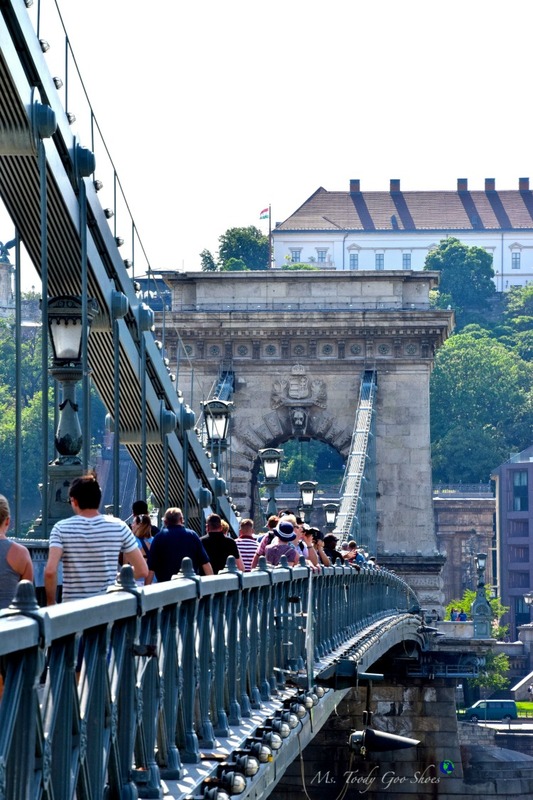 We stroll down to the Danube River and the famous Chain Bridge, one of the world's most impressive spans. On this warm summer-like Saturday, it seems that everyone in the entire city is out and about, enjoying the day. The bridge is long, and it's hot, so we go halfway across and turn around. All the way across will take us back to Buda, where we were this morning. The views from Chain Bridge do pay dividends. The others head back to the hotel to rest before dinner. 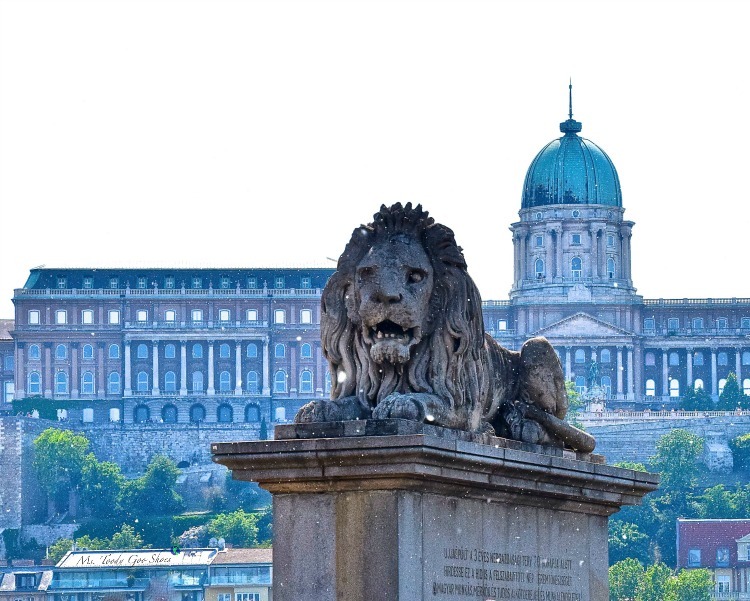 With only two days in Budapest, I refuse to waste a minute, and continue wandering around and exploring the Pest side where we are staying. It's bustling, and hectic, much like New York or London. The main streets are broad and filled with noisy traffic, but just beyond one can find quiet side streets. We have an amazing dinner on our own tonight at Rezkakas Bistro. The goulash is delectable, and the live trio of local musicians is a perfect accompaniment. 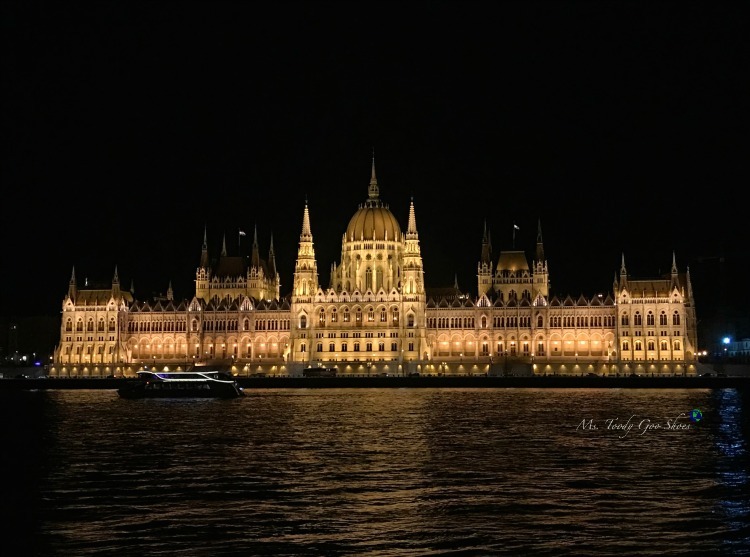 After dessert, I insist that we take a taxi back to the Buda side of the river to see the Parliament lit up in all its glory. 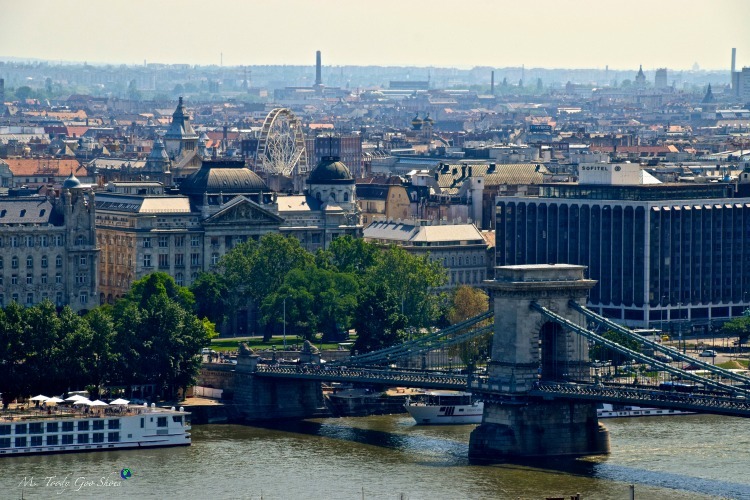 After all, it is the Hungarian equivalent of seeing the Eiffel Tower at night. 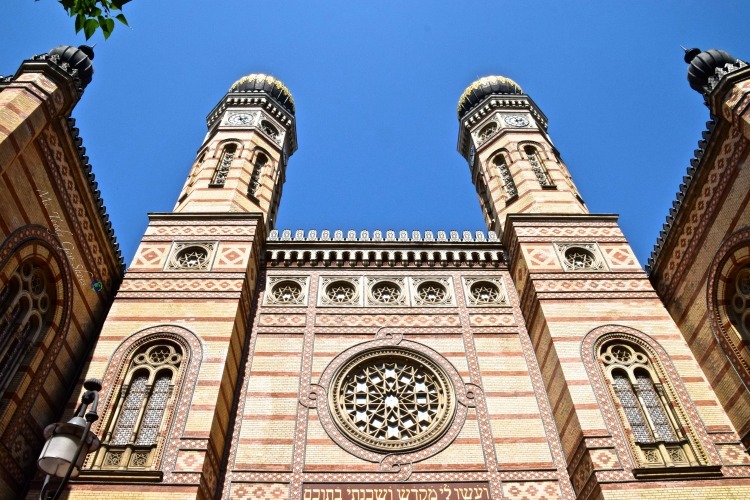 It's morning now, and I am looking forward to seeing the Doheny Street Synagogue. 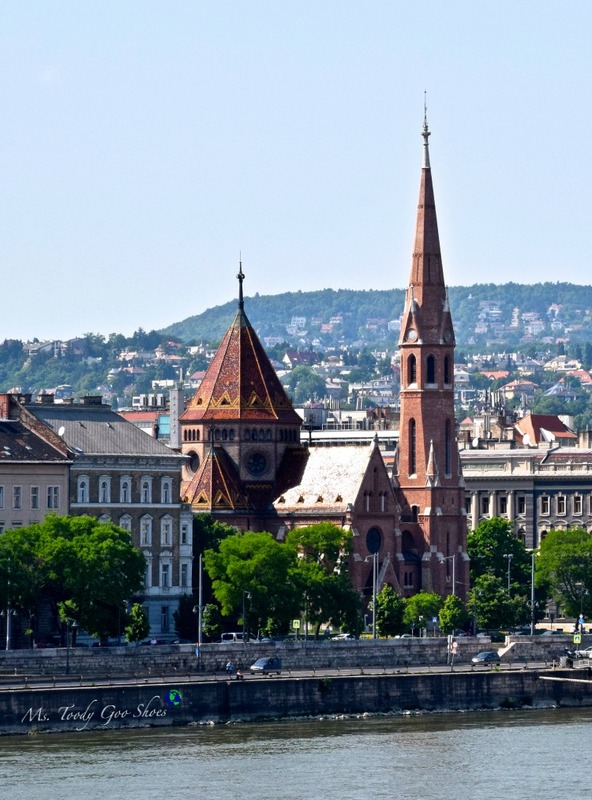 It is the largest in Europe, and the second largest in the world, after Belz Great Synagogue in Jerusalem. 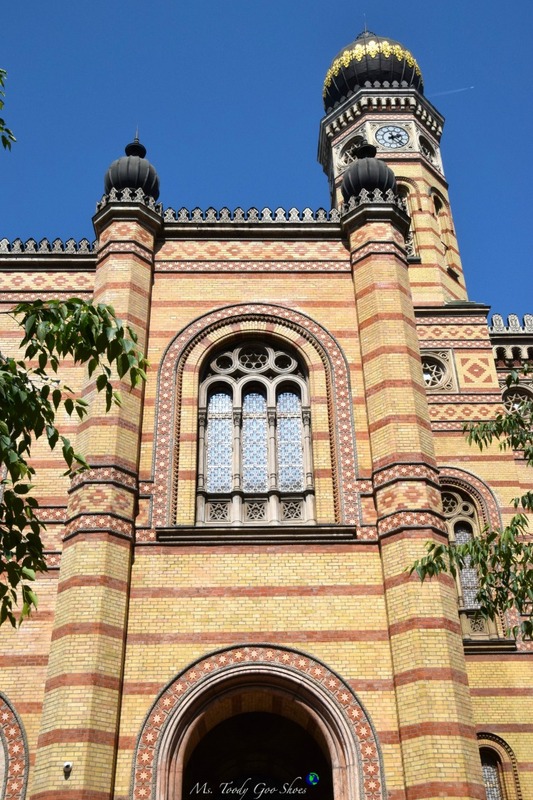 Compared to the synagogues we saw in Prague, this one is relatively new, having been built in the mid-1800's. It's so large, I can't get far enough away to capture it in its entirety in my photos. I know I'd find it to be an emotional experience to attend a service there. 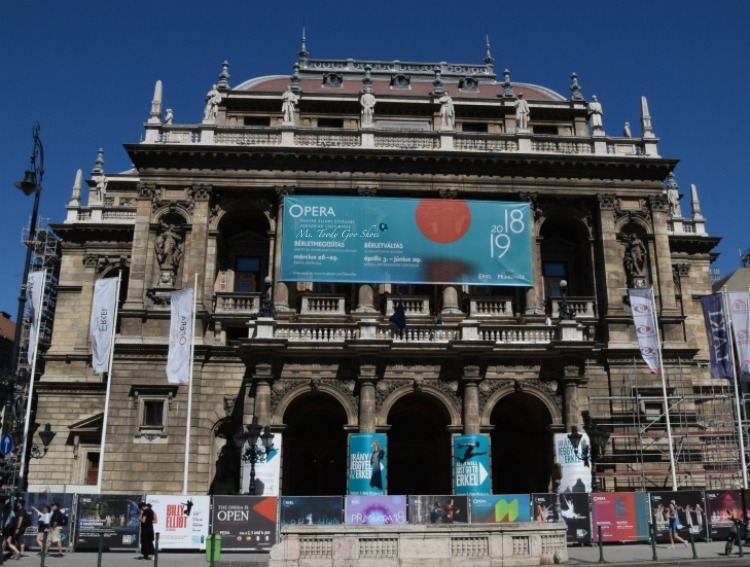 Just a few blocks away is another iconic landmark, the Hungarian State Opera House, which opened its doors in 1884. 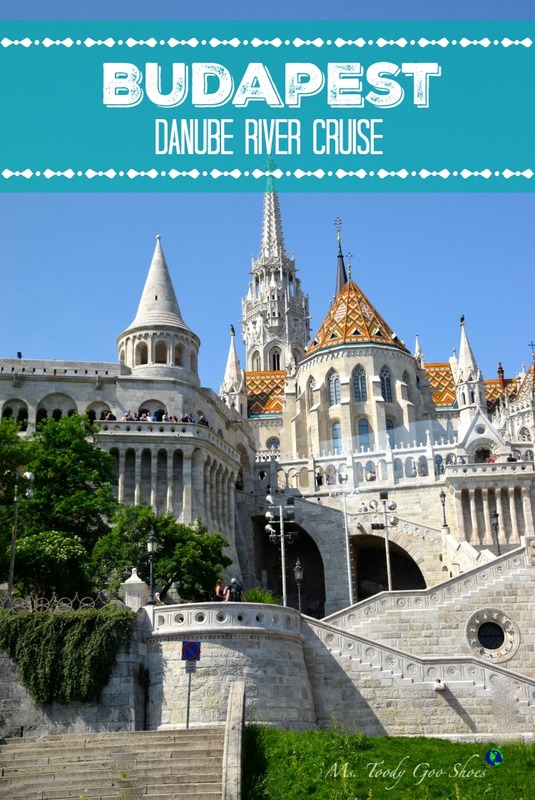 After lunch, we have free time, and the must-see on our list is Shoes On The Danube. 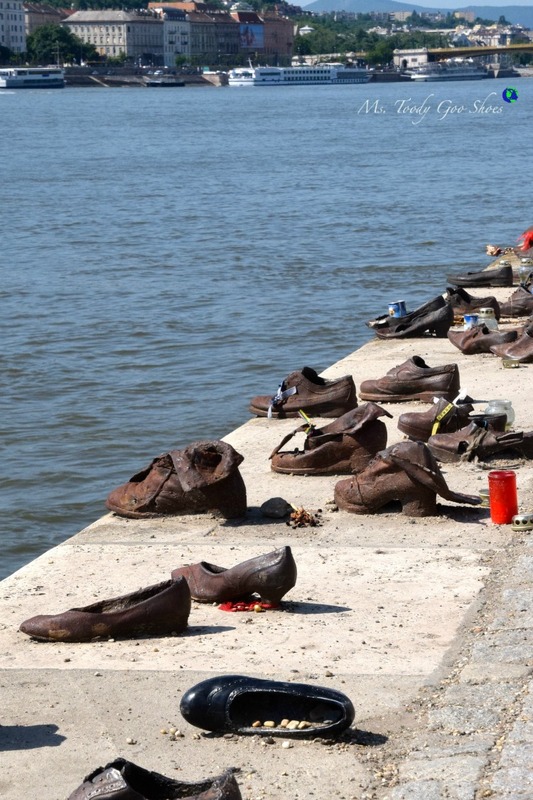 It is a memorial to thousands of Hungarian Jews who were shot into the Danube in the mid-1940's. Many were told to step out of their shoes, and then were shot, falling into to river. The 60 pair of shoes along the river bank look real, but they were sculpted out of iron to replicate shoes of the era, and are are bolted to the concrete. It's a chilling reminder of persecution not so long ago, looking as if they were left there recently. The memorial is just a five minute walk from the Parliament building. Tonight is the final night of our tour. 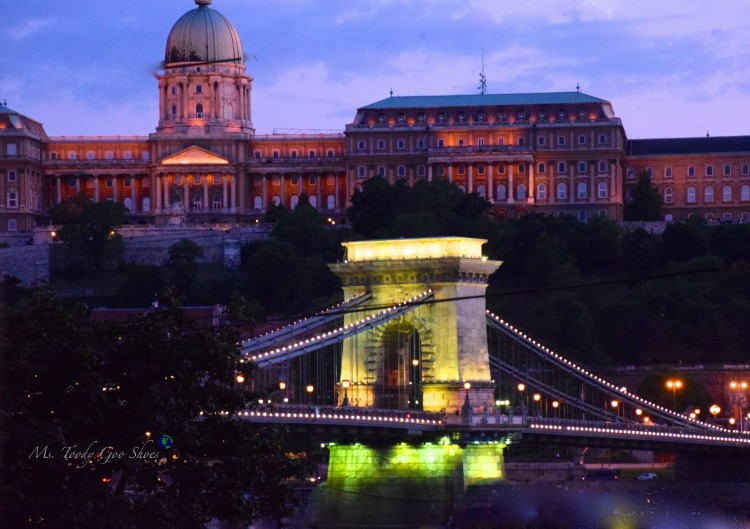 Our farewell dinner is held in the Akademia Klub, a magnificent building near the river bank. The food is fair, but the entertainment is lively. There is no air conditioning, and the room is sweltering. I'm uncomfortably hot, and tempted to yank off my Spanx and toss them into a garbage can. But, thanks to the views outside the window as the sun goes down, my Spanx prank is soon forgotten. The music stops, the buses take us back to the hotel, and with that, vacation is over. If only we could click our heels and be there. Read A Day In Medieval Regensburg, Germany here. Read Picturesque Towns Of Austria Part 1: Engelhartszell here. What? You actually wear spanx on vacay when it’s hot?! You must have a masochistic streak! I don’t know if I should bow down or bop you in the head. I’m lucky I can get a pair of underwear on if it’s over 70 ;). I don’t blame you one bit for taking a cab to see the parliament. It’s beautiful, and I know what you mean about mixed feelings when you leave to go home. I think you would really like Croatia Amy. It seems right up your alley. What a beautiful city! The shoes along the river gave me chills. Wow Amy what a beautiful place to visit. The photos you look are amazing! I really enjoyed reading about all the places that you visited on your vacation. OMG that is truly a wonderful tour, and thanks so much. I might not be there in this lifetime but it is one of my dream country to visit. And your pictures are so awesome especially that night shot of the parliament, but truly everything you posted are great. The narrative lovely too, more thanks.